At times, we consumers can feel a bit powerless in the wake of so many recalls of everything from food and medicine to toys, knowing that so little of these goods actually do get inspected, and often the inspection process fails. 2007 was a rough year in this capacity. Last year, there were a record number of contaminated meat recalls, primarily from E. coli risks. Yet, it may surprise many people that despite its role as an inspector, the USDA does not have the legal authority to force a recall of meat and poultry product. It’s a frustrating situation. Indeed, in the wake of the record recalls, the only outcome by the USDA was to determine that a “study needed to be done on the situation.” In other words, little action by the USDA to address the situation and partial, voluntary recalls by the meat companies. Status quo. And, then the Hallmark/Westmoreland products investigation hit the Web in the form of a video of shocking animal abuse and illegal use of downed cattle for human consumption, including school lunch programs. Actions that occurred despite twice a day visits from a USDA inspector.The video traveled rapidly from blog-to-blog and was soon even broadcast on local news stations. Tremendous public outcry on both the abuse and the potential for food contamination followed, including a petition consumers could send to their representatives to end the use of downed cattle. 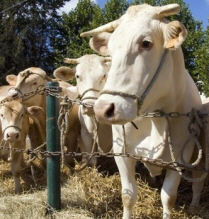 The result was the largest beef recall in history, some 143 million pounds dating back two years. While much of this beef has likely been eaten, the scale of the recall will send a message to the meat industry. Further, two of the employees captured on tape abusing the cows have been charged. Arguably, the charges should extend to those in the company management that gave the directive to these employees, but hopefully that will follow. The difference in the situation is you. Your informed action, grassroots sharing of the video and information, and awareness was the key to holding the USDA and Hallmark/Westmoreland accountable. Thank you. Keep up the good work. Proud to be a vegetarian. I have been avoiding this video. I would most likely cry for days if I did see it. Have you ever seen a video called meet your meat? I didn’t eat meat again after watching it. And I did cry for days. How Can I Detox My Thanksgiving Diet?